I have to say I am not a fan of quick-release, especially for seats. I do not need to raise and lower my seat nearly enough (almost never) to justify the annoyance of having to take my seat with me or worry that anyone could just walk past and take it with no tools while my bike is locked up somewhere. My local bike shop has locks that you can put on quick release seats that make it so you require a special key, but they run something like $50 which seems too steep to me! I could also just replace the quick release part with a regular bolt, which might be the way to go, but still somewhat insecure. I'm just looking for feedback or recommendations on reasonably inexpensive ways to secure seats and wheels for some piece of mind. 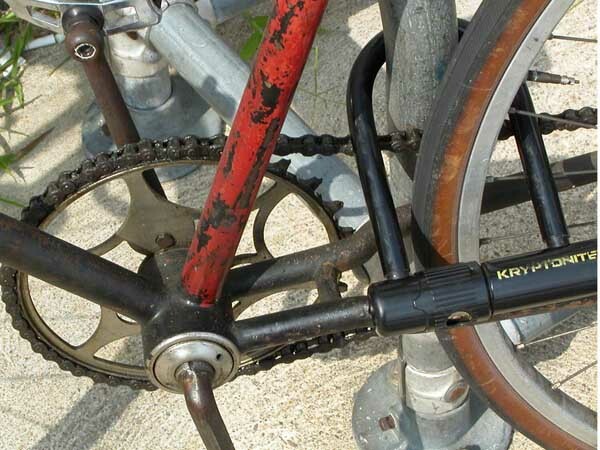 If you use a U-lock, you can use Sheldon Brown's lock strategy to lock at least your rear wheel along with the frame. This is the approach I use. Remember: the shorter the U-lock, the safer you are. For your front wheel, you can bring along a second U-lock, a cable, or use pitlocks. For the saddle, simply switch away from a quick-release skewer to an allen head bolt and stop worrying about it getting stolen. You don't need to adjust your seatpost often enough to warrant the added risk posed by QR levers. Unless you really care how the bike looks and about extra 50 grams on the bike... Find a piece of old chain. Wash and clean it. Find a piece of old tube, best would be road bike tube. Measure the distance between saddle rails and top chains - double it and you'll need that much of tube and chain. Cut the tube and chain to the measures. Pull the chain through the tube, lock the chain around your chainstay and seat rail. Tube is required so chain does not rattle too much and does not damage the paintwork. Works against opportunistic thief who doesn't have chain tool. I've used a Pinhead lock to lock my wheels, while parked on the side-walk for the last few months, and it hasn't been stolen yet. You should be able to thread a fairly standard cable lock through the rails of the saddle and the rear wheel to secure them to the frame. Use another lock to secure the front wheel to the frame and something immovable - preferably a fixed bike rack. Make sure the cables are thick enough to deter your local class of bike thief. I agree with you about quick release on the seat being pretty much a waste of time. Once set, I rarely adjust my seat height! Replace with a standard bolt to simplify. Quick release on wheels though is invaluable. I simply put a ball bearing with some grease into the bolt head. You can take them out with a strong magnet. But it is very difficult to extract them otherwise. I don't know if they are still available, but it used to be you could buy a rather simple device... Likely not hard to make one. Essentially, a "star-fangled nut" was inserted into the bottom of the seatpost, and an eyebolt screwed into that. Then, a short length of steel cable ending in a plug that was a bit smaller than the seat-tube diameter. Finally, an extra-long cap screw for the water-bottle cage. I'm not sure where to get them in the US but the Trans X QR axels are cheap and cheerful. I'm using them and they do the job. There are two versions, one is a regular Allen key type, and the other is a 'security' design which is basically a pentagon Allen key like design that requires the tool they provide. It's secure by virtue of less people having the tool, rather than by it being a proper type of key. I have both and they are okay for a budget axel. They do a seatpost bolt with that too. Alternatively you could replace your whole seatpost clamp with a non QR one but that would cost more than I suspect you want to spend. I have a folding bike that, in order to fold completely, needs to have a quick-release seatpost. 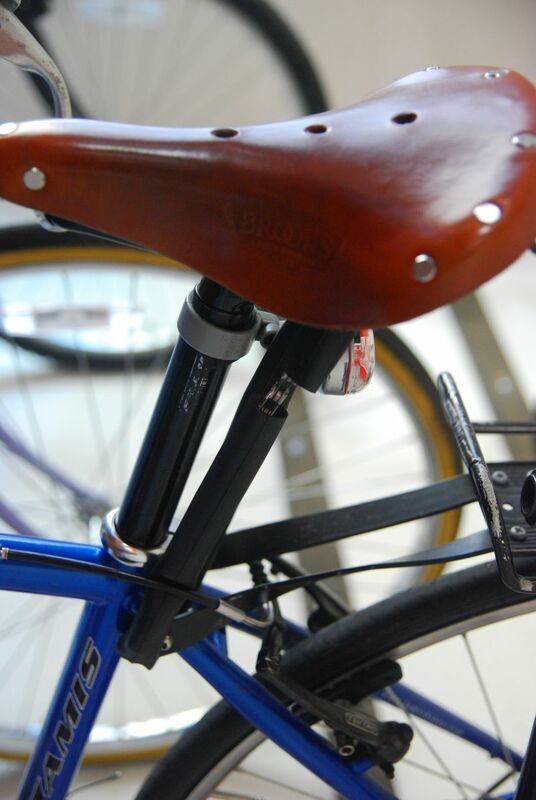 Unfortunately, in order for it to be comfortable, it also needs to have a fairly nice saddle (Brooks B67). In order to protect my saddle, I use a two-foot-long piece of 1'4" nylon-sheathed steel cable. On one end, I have it permanently fixed into a loop around the seatstay with an aluminum ferrule. The other end is permanently fixed into a loop around the rail of the saddle with another ferrule. A thief could certainly pop that cable and walk away with my seatpost. I think it just as likely for a thief to have a pair of bolt-cutters as an allen-key, though--and my saddle is only afixed to the bike with an allen screw even if you set aside the quick release. The total cost of that setup is about $5. Tools required include a cable-cutter, razorblade, crimping tool (or an anvil and hammer). My wheels on that bike are bolt-on. My other bikes, I use Pinheads, as @ChrisW suggested. I have been happy with the Pinheads. Their price is worth it to keep my good wheels around. Beyond that, you can have a hardware store make up a lightweight cable about 3-4 feet long with loops crimped on both ends. This can be looped around the front wheel, through the seat frame, and then locked with your regular lock. If you have bags you can run the cable through eyes on the bags as well. (And you can make the eyes with a similar but shorter cable bolted to the inside frame of the bag.) This won't deter the determined thief but will discourage the "opportunist". I live in DC, which has a bike theft problem, so I've been through the ringer and can share my experience. As far as the saddle goes, I never had anything particularly desirable, but you need to go the extra mile to be sure you keep your standard gear here. I purchased a short, lightweight cable with a loop at both ends, looped it through the frame, through the other end, pulled tight to secure to frame, then reafixed my saddle with the loop on the free end secured within it. Spin the seatpost to pull in the slack and secure it in place with a standard, slow, tooled-release bolt. Not fool proof, but its a hassle free to be sure that your seat is more trouble than the next guy's! My only added precaution is a ulock on the back wheel and frame when I have standard gear and bolts, which is the norm and makes things quick and easy. Add in a cable to also grab the front wheel when I'm using nicer wheels and/or quick release. Also, make sure you lock it to a secure place. Sign posts are not secure, my last bike was stolen by removing the sign and lifting the bike and lock off the top of the post! Regarding the image of the bike with the ulock on the wheel: that wouldn't last a hot minute here. The first guy that wanders by with bolt cutters would snip your wheel and make off with your bike. Make sure you actually get the frame inside your lock. Do you know what size seat post you need for your bike? Write it down so that you can order a replacement easy enough after it has been stolen. I learned this the hard way - parked up overnight outside a friend's flat, someone came along and took my seat + post. I was annoyed and I did not find it so easy to quickly get a replacement. If I could have just phoned around the local shops I would have located a 26.8 mm seat post that bit quicker. (As it was I paid over the odds for a smaller seatpost and shim, plus I had to ride seat-less). There is a lot to recommend in Sam's tip of a low-security 'standard' cable lock coupled with a D-lock. You can do better than that still if you can get the ABUS 'Partner Pack'. This is a D-lock and a cable lock that share the same key. On your trip to/from work where you have a safe place to park you can carry just the lighter cable lock and use that to secure your bike for the few minutes stopping off on the way back to pick up groceries. Then, if you go into the center of town and have to park where you really do not want to then the D-lock and cable can be brought to lock up as Sam describes. On my mountain bike I have the special five-sided allen-key with special undoing handle-thingy. This is great in principle and I have never had my wheels or seat stolen on that bike thanks to those bolts. However, there have been a couple of occasions when I have needed to get somewhere quickly and gone for the taxi/back of friend's car option only to find that I left the special key behind and cannot disassemble the bike. Folding bikes are quite useful for 'theft strategy'. You can easily pull quite a lot off the bike with the quick release levers, including the seat and post. However, in reality, this does not happen because the folding bike can be put under a desk, parked in a pub, left at reception or even pushed around a supermarket in the trolley. Only a simple £5 combination lock is needed to deter casual theft during quick visits to shops. Not the answer you're looking for? Browse other questions tagged wheels saddle security quick-release or ask your own question. keyed (locking) skewers and seat bolts: recommendations? Quick release wheels on kids bikes? Can I replace my road bike's front wheel quick release with any quick release?